Kitchen Remodel: Episode 24 Some knucklehead cut up the framing in our kitchen ceiling at some point. I'm fixing it (with a new nail gun!) before I seal up the drywall. 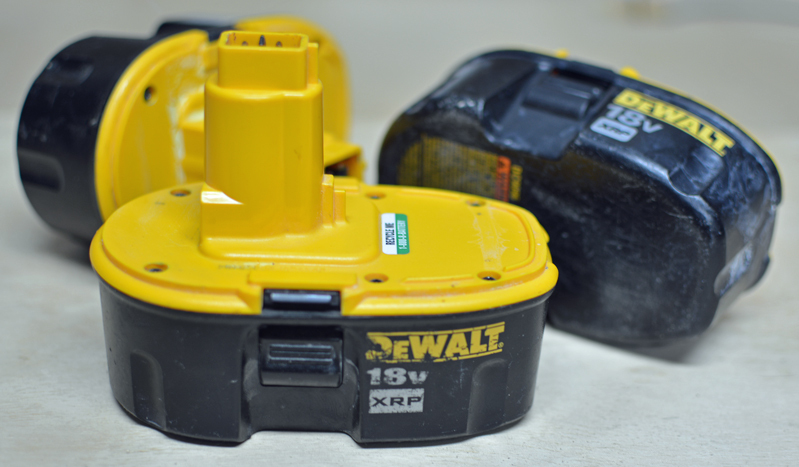 Regular readers of this blog know that I've been personally wielding DeWalt 18 volt cordless tools on my projects for years. I love 'em; absolutely no complaints. 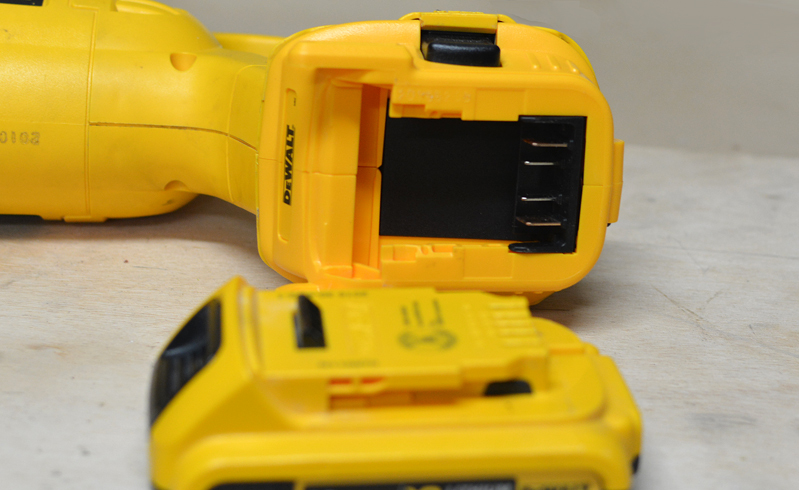 When DeWalt gave me an early-bird chance to try out their new battery adapter and bring modern battery technology to my older tools, I couldn't wait to put it in action. I've run it through its paces for a month on a variety of my tools. I believe DeWalt's 18 volt line of cordless tools has been in the market for about 20 years. It's been one of the most popular lines of professional-quality cordless tools, for a very long time. They're certainly the most common brand on the construction sites I've visited. I've had my own set for about 8 years, and all the tools are still going strong. They've outlasted and out performed any other brand of cordless tools I've owned by several years, leaving me a bit of a fan-boy. This battery adapter is a huge deal. Years ago, I worked a second job, at a department store selling their popular exclusive brand of tools. It was common that I'd bear the brunt of a shopper's frustration when they learned that each year's version of the store-brand tools had an battery configuration incompatible with the prior model. It was odd, even though each generation was a same voltage, NiCd battery, there would be a slight change to a a bump or ridge on its case, preventing interchange between versions. People would end up purchasing new tools, rather than ordering older batteries from the factory. Was it an "engineered obsolescence" sales scheme? Although many people bought new cordless tool sets, lots left to shop elsewhere, swearing off the brand as they went out the door. DeWalt on the other hand, has supported tools that last for a seriously long time. You can go to hardware store, home center, or Amazon.com today and get an 18 volt NiCd battery, or even a brand-new 18 volt tool. That's simply incredible, considering the modern system of 20V MAX tools has been out for 4-5 years. The introduction of this battery adapter is awesome; now we can start transitioning towards newer technology, bit by bit, piece by piece. I own three 18 volt XRP batteries. I've worked them hard over the years. One recently decided it was time to retire and refused to take another charge. The other two are showing signs of age with their full-charge run time declining slightly. I'm still running them hard. These 18v batteries are beasts. They pack a lot of punch and run for a long time, even at their advanced age. I've never have trouble working two to three tools on a project, cycling between my three batteries. Now with one retired, I don't want to spend the dollars on replacements, when the modern stuff is so much better. The new Lithium Ion batteries pack much stronger punch with a better power to weight ratio, almost no self-discharge, and a cool led "fuel gauge". Check out the size difference between the 2 amp hour Lithium Ion 20V MAX battery pack that came with my DeWalt Cordless Oscillating Multi Tool and one of my my beefy 18v XRP nickle-cadmium packs. There's a significant weight difference too. Obviously, there's more than a little physical difference between the old plunge-in style NiCd and the slide-on Lithium Ion. That difference is what the Dewalt Battery Adapter overcomes. It also holds the pack at a slight angle, presumably to mimic the tool balance we are accustom to with the old packs. I slipped the adapter into my 18 volt Reciprocating Saw, just as I would the standard battery pack. It felt like it was of the same beefy plastic the tools are constructed from. There was a slight color variance, but I'm fairly sure that's due to 8 years of Arizona sun beating down on my tools as I work. Of course, I'm not going to complain about color variation, these are workin' tools after all. The base of the adapter has the same electrical connections as the modern DeWalt MAX tools. The battery pack slides on from the front and locks onto the adapter. 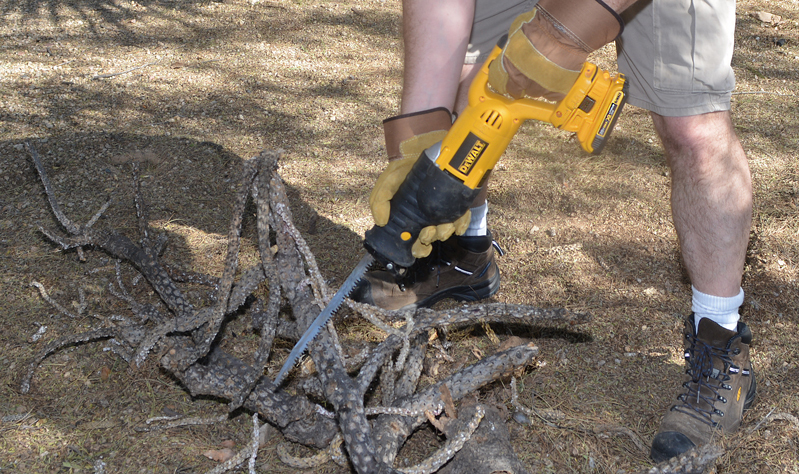 Since February in Arizona isn't about shoveling snow, I let the DeWalt 18v Cordless Reciprocating Saw chew on some yard work for a bit. I cut palm tree fronds, trimmed the mesquite, and chopped up a dead cactus. I wasn't sad to see that stinker go either. It was the son-of-a-gun that seemed to shoot spines at me whenever I was in its vicinity. It still managed to get one last parting shot when I accidentally flipped a chunk up into the front of my shirt, leaving some painful little holes in my chest. The saw ripped along, fast and powerful. It balanced good in the hand with the new batter set-up. I finished with plenty of juice in the battery. Another adventure where I brought the battery adapter into play was the repair of our rooftop heat pump (Post: Cold at Night! A DIY Heating Repair Adventure ). I removed and replaced a bazillion screws with my DeWalt 18v 1/4" Impact Driver fueled by the 20V MAX Lithium Ion battery through the adapter. I ran the impact driver until the sun went down,...literally. The battery adapter with the 20V MAX battery pack with worked just fine in my circular saw as well. Power and speed, making sawdust in the garage. I understand the adapter works with most, but not all of the legacy DeWalt 18 volt tools loose in the wild, but it worked with my whole arsenal. I tested the rest of my collection with success. The adapter worked well with my cordless cut-off tool , my XRP Hammerdrill / drill / driver , and my flexible floodlight. The only complaint I have is that it takes a bit of extra muscle to remove the adapter; it seems to latch in tighter than the 18v battery packs themselves. Not a problem if you are just changing the batteries, but if you want to slip the whole deal on another tool, it takes just a little extra grunt. I'm really happy with this cool widget. Frankly, I'm surprised DeWalt even produced it. Who could complain if they slowly phased out the 18 Volt line after such a long operational lifespan? Not only do they continue to support the older line, they chose to offer this adapter as a bridge to their current line. That's loyalty to your customers my friends. I used a single 2 amp hour 20V MAX battery on my tools. I believe it outperformed the 18v XRP packs on their best day. 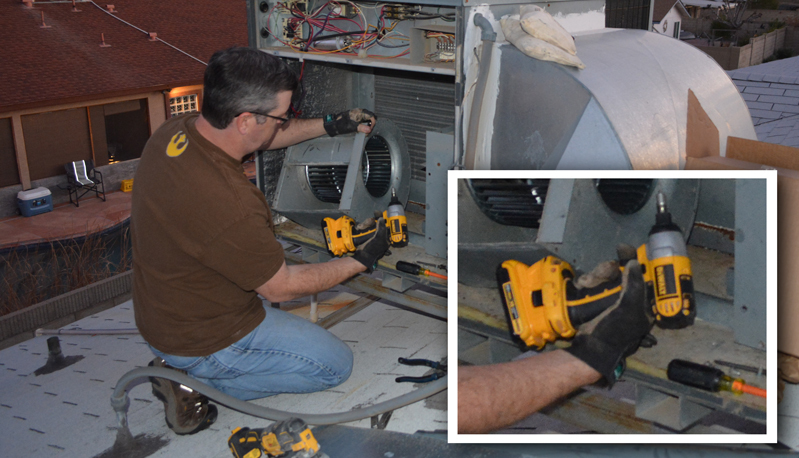 DeWalt also makes larger-capacity 20V MAX packs, ranging up to a 5 amp hour beast. Keep an eye out, I'm going to be running this little champ on some upcoming projects. a demo unit to try. All opinions and experiences are 100% my own.